Time on the beach is the ultimate way to spend a New Zealand summer; be it under an umbrella with a good book, eating fish and chips, or catching waves. Book a car hire in New Zealand with VroomVroomVroom to get to some of the best beaches; that way you can stay all day, no getting back on the bus when someone else says it's time to go! 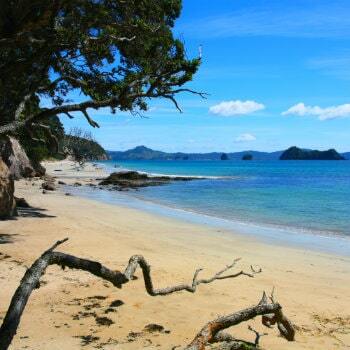 Hahei Beach on the Coromandel is a New Zealand favourite and seriously one of the most breathtaking beaches on offer. This sheltered and fabulous beach is perfect for for fishing, boating and swimming. Kick back on a towel and sunbathe, or slip on your jandals and take a walk up along the coast. There's a walking track from Hahei around to world famous Cathedral Cove which takes around 40 minutes. You can also discover the marine wildlife in the Haheu Marine Reserve. The drive up to the majestic Coromandel Peninsula is a scenic one, with Thames as the main service town. It's best enjoyed with company so make sure you book a larger-sized car rental vehicle like an SUV or van or maybe even a campervan rental. On the southern end of the beach, you'll find the historic Te Pare Historic Reserve, which was once the site of an ancient Maori Pa. The views from the headland are absolutely beautiful, extending for miles up and down the coast. Directions: You can rent from Auckland Airport and drive to Thames via State Highway 1 and SH 2 toward Coromandel Pensinsula. Continue onto New Zealand State Highway 25/State Highway 25 to your destination. 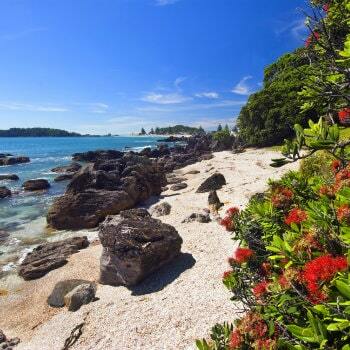 With clear blue waters and soft white sand, Mahia Beach is a white sand wonder with breaks that are sure to impress. A summer staple for those who live on the East Coast of New Zealand, it's nearest to Gisborne as a pick-up location for a rental car. Cheap car rental is easy with VroomVroomVroom and many of New Zealand's best beaches are only accessible with a vehicle. So pack your swimming trunks, maybe a tent and a chilly bin of food and drinks. An ideal place for water sport lovers, make sure to bring your paddle board or surf board and enjoy the sea. If you are partial to a bit of diving or snorkeling, don't forget your flippers and snorkel. There are plenty of fun things to do in the area including fishing, golf, tramping and even hiking. Bring a good pair of walking shoes and head up to the iconic Mokotahi Hill at the far end of the beach. 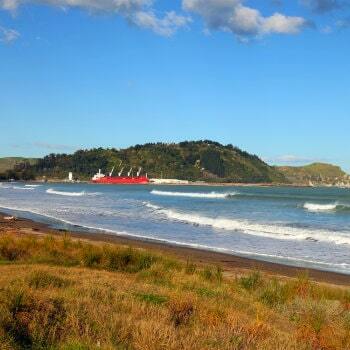 Another popular beach, which is situated only a few kilometres south of Gisborne is the beautiful Midway Beach. Directions: From Wairoa, take State Highway 2 heading towards Gisborne. At Nuhaka continue straight, ahead towards Mhia. The Bay of Plenty region has plenty to offer, with endless sunshine, and cool clean sea to wash away your blues. You can start at the eight kilometre-long Waihi Beach or continue driving for another 40 minutes to Mount Maunganui. Waihi Beach has a surf club at its northern end, and a quieter estuary beach and boat ramp at the Bowentown end. If you searching for more sheltered beaches, you can access Anzac, Shelly and Cave Bays athe southern end of Waihi Beach. Mount Maunganui beach stretches from 'The Mount' for a whole 16 kilometres to join Papamoa beach. You may also follow the path to the summit of Mount Maunganui where there are spectacular panoramic views back down onto the town and bay. Directions: To get to the Bay of Plenty, you can pick up a rental car from Auckland Airport. It's around a two-hour drive to Waihi Beach. If you are planning on flying into Tauranga, Rotorua, or Whakatane, it's less than an hour to one of the best beaches in New Zealand. Don't forget the South Island, it has its share of stunning coastlines too. Nelson is at the very top of the South Island and frequently has the highest sunshine hours for the whole country. 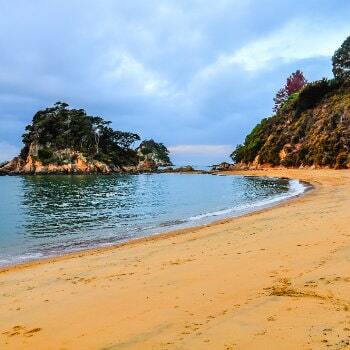 Kaiteriteri Beach doesn't have surf, but it does have golden sand. It is the gateway to the Abel Tasman National Park, and is perfect for sea kayaking. Bask in the sunshine and spend the day swimming, or you can rent a mountain bike to explore the trails of the Kaiteriteri Mountain Bike Park. Enjoy dining at the beachfront restaurant or try one of the many water activities on offer. There are numerous short walks which can be enjoyed in Kaiteriteri. These include Kaka Pah Point and Withells Walk, but the Abel Tasman Coastal Track is a popular, must-see spot. Go on a picnic and have a relaxing day in the bush and on the many beaches. Directions: You can pick up your rental car from Nelson Airport and head northeast on Trent Dr toward Rapide Pl. Continue onto Kaiteriteri-Sandy Bay Road via State Highway 60 to your destination. Situated on Koekohe Beach between Moeraki and Hampden are one of the most enchanting and popular attractions on the South Island - Moeraki Boulders. Currently, there are 50 boulders and they are now said to be protected by law. 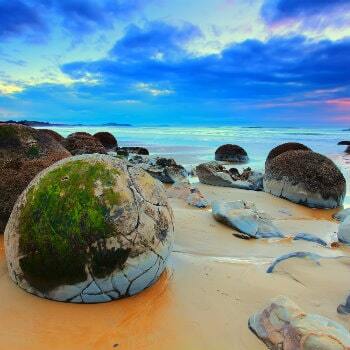 Measuring up to three metres in diameter, the Moeraki Boulders are large and spherical boulders which can be found at Koekohe Beach along a stunning scenic road. Better seen during low tide, the boulders are a very popular spot for tourists and photographers – and for good reason! See the penguins and walk to Katiki Point Lighthouse. Other great things to do on Koekohe Beach include swimming, boating and fishing. Directions: You can pick up your hire car from Dunedin and head north on SH 1 toward Queens Gardens. Keep left to stay on SH 1 and follow signs for Route 1/Timaru onto Moeraki Boulders Road to reach your destination. Being the only large West Coast town centre situated next to the beach, the remarkable Hokitika Beach is simply hard to ignore. 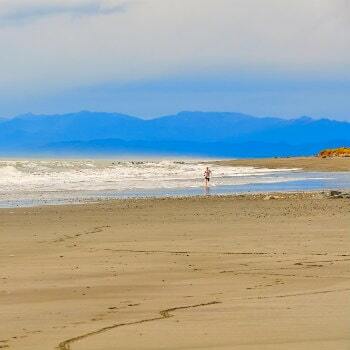 The Hokitika Beach is another amazing place to unwind and relax with family and friends. This is also an ideal place to carve your own greenstone pendant, since Hokitika is known as the jade capital of New Zealand. Amazing quality arts and crafts matched with spectacular landscapes, a vibrant history and laid back attitude make Hokitika Beach a perfect place to visit. Watch and get that perfect sunset shot at Sunset Point. The popular Hokitika driftwood sign also makes a good photo opportunity to go along with the sunset. Have fun scouring the sand for pounamu, also known as NZ Jade. Directions: You can pick up your rental car from Greymouth and head north on State Highway 6 toward State Highway 6 to reach your destination.